Cellfina™ is the only FDA-cleared minimally invasive procedure, clinically proven to improve the appearance of cellulite for at least three years, longer than any other FDA-cleared treatment for cellulite. Performed by a qualified physician in our office, Cellfina™ combines proven and innovative technologies to treat the underlying causes of cellulite on the thighs and buttocks. Several of SkinCare Physicians’ dermatologists have been at the forefront of this novel cellulite treatment, and our practice has been involved since inception. Much of the scientific work, protocol development and clinical research that led to its FDA clearance was performed at SkinCare Physicians over the last several years. Our practice was the first in the United States to perform initial Cellfina™ treatments, and has been selected to be one of the lead training sites for other centers. How does Cellfina™ work to improve the appearance of cellulite? 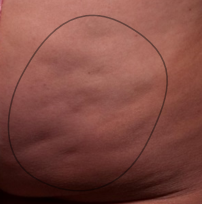 Cellulite is caused by fibrous bands pulling down the skin and creating dimples. Cellfina™ uses an innovative technology to acquire the targeted dimples and release them with a directed and precise micro-tool. First, a local numbing solution is administered and then a physician uses the Cellfina™ system to release the fibrous tethers. By releasing the fibrous bands under the dimpled areas, Cellfina™ can reduce the appearance of cellulite in just one treatment session. How soon will I see improvements with my cellulite? Within just three days after treatment, patients in the FDA-cleared pivotal study reported feeling very satisfied with their results. After three years, 94% of patients were satisfied, surpassing patient satisfaction rates for all other cellulite treatments. At three years post treatment, physicians were accurately able to identify clinical benefits in 99% of patients. There have been no serious adverse events associated with Cellfina™. The most common side effects reported by patients in the early studies were soreness and bruising. Just three days after treatment, patients rated the pain as minimal and the vast majority only felt discomfort with touch or pressure to the treated area. This minimal discomfort faded quickly with time. Additionally, there have been no long term reports of discoloration or darkening of the skin. The in-office procedure takes approximately one hour, depending on the individual patient, and the number of areas being treated. There is no need for pretreatment pain or relaxing medication, so you are able to drive yourself to and from the procedure appointment if desired. There is limited downtime associated with Cellfina™. Some patients experience initial soreness and tenderness, but these side effects resolve quickly with time. While you do not need to take time off of work or activities, the numbing medicine that is placed under the skin does leak out over the first one to three days. A tight fitting compression garment will be worn for the first week after the procedure, and strenuous physical activity should be avoided the first few days after treatment. At SkinCare Physicians, our doctors and staff are highly experienced with Cellfina™ as a minimally-invasive treatment to improve cellulite. Get started when you request a consultation online to come visit with us.